the Sydney Morning Herald Wed 16 August 1939 p18 Mounted and foot police led the funeral cortege of Inspector A. C. Muir, who was buried with full police honours at the Eastern Suburbs crematorium yesterday. 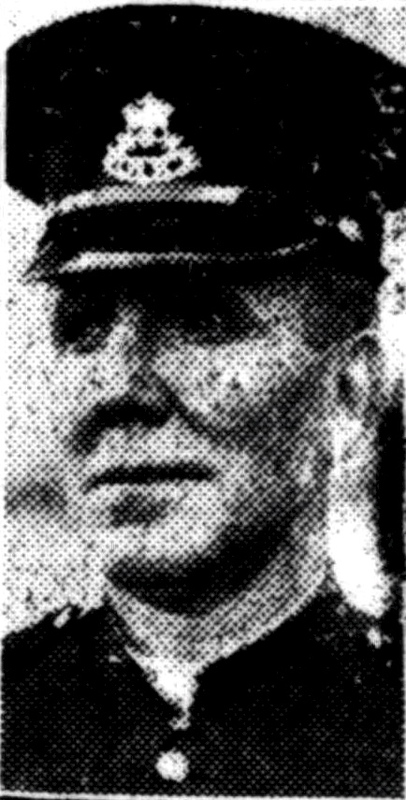 Inspector Muir was drowned in Brisbane Water on Sunday. The late Inspector A J Muir who was to have taken up duty at Regent Street Police Station but who was drowned at Brisbane Waters near Woy Woy on Sunday while fishing, was given a police funeral yesterday. After a service at St Stephens Church Macquarie Street which was attended by the Commissioner of Police, Mr W. J. McKay, and most of the police officers stationed in Sydney, the cortege moved to the Eastern Suburbs Crematorium. Headed by the police band, mounted police and the police motor cycle squad about 80 members of all ranks marched with the cortege from the church to Stanley Street. Many residents of Katoomba, where the late Inspector Muir was for many years in charge of the police station came to Sydney to attend the funeral. Policemen from many country centres attended the funeral today of the late Inspector Alexander Muir, who was drowned at Gosford last Sunday. 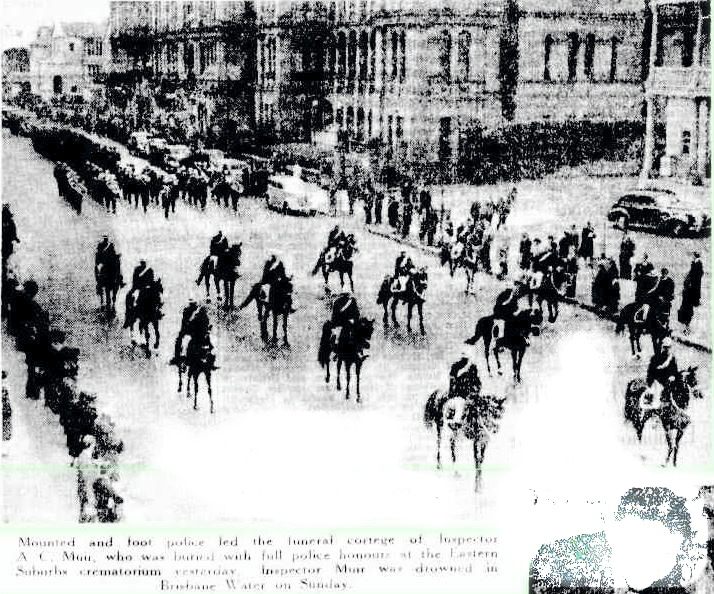 The cortege, headed by a police band, passed in dignified procession through the city streets, and was followed by many civilians anxious to pay their respects to a well-known police identity. The Commissioner of Police (Mr. McKay) and the assistant Metropolitan Superintendent (Mr. Collings) were members of the funeral cortege. The Rev. A. J. Parker, formerly of Lismore, and a lifelong friend of the deceased, who officiated at the church service at St. Stephen’s Presbyterian Church, paid a high tribute to the qualities and character of the late Inspector Muir. “He was a man who was always willing to give a helping hand to those in need,” declared the Rev. Parker. Inspector Muir was a church elder at Lismore for a considerable time. The remains were cremated at the Eastern Suburbs Crematorium, and interred at Rookwood cemetery. The chief mourners were his widow, Mrs. Madge Muir, son, Alister, and daughters, Mrs. Ruth Campbell and Misses Jean and Biddie Muir, daughters. Police Inspector Muir, 59, who was drowned when a 16ft. launch overturned at the entrance to Brisbane Water on Sunday night, was formerly stationed at Lismore, and was on two months’ leave when the tragic occurrence took place. The widow, one son and three daughters survive. Police Inspector Muir, who had only left Wagga on Friday last, was drowned, and two companions, Archibald C. Fowler, of Katoomba, and Leslie Roy Whatley, of Woy Woy, were rescued after a sixteen foot launch had overturned on the bar at the entrance to Brisbane Water early on Sunday night. The party had been on a fishing excursion and rough weather caused the launch to capsize. The men clung to the overturned launch, but Inspector Muir was washed upwards of 100 yards away by a strong current. Inspector Muir, who was on two months’ leave, was staying at Ettalong before beginning duty in Sydney. He had been transferred from Wagga, where be bad been a very popular officer. FATAL FISHING TRIP. SYDNEY, August 14. Inspector Muir, of Regent-street Station, was drowned in Brisbane Water when a 16ft launch capsized in the heavy surf on Sunday. Muir was spending a holiday at Woy Woy, and, with two other men, Leslie Whaley and A. Fowler, spent the day fishing. They were returning to Woy Woy and while crossing the sand bar were caught in a heavy swell. The surf broke over the boat and while the men were bailing out a wave overturned the boat. Whaley and Fowler clung to the upturned boat, but Muir decided to try to swim ashore, using the pine flooring board to assist him, but an hour later the plight of Whaley and Fowler was noticed and a ferry picked them up. Muir was found 100 yards from the overturned launch unconscious. Attempts to restore animation were unsuccessful. Police Inspector Muir was drowned at Woy Woy during the week end. He was spending a short holiday in that neighborhood before taking up an important position at Regent Street Station, Sydney. Deceased formerly had control of Katoomba, Lismore and Wagga districts. He left Wagga last week for his new position in Sydney.